The Choral Foundation has been an integral part of the Cathedral's life since mediæval times. 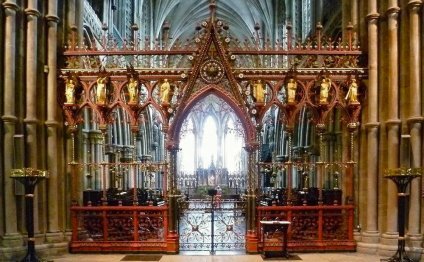 The original Cathedral statutes made provision for four Priest Vicars and ten Lay Vicars Choral of which one would also act as Organist. The statutes were revised in 2001 to include the Assistant Organist, and make provision for three Choral Scholars within the Choral Foundation. A further revision was made in 2012 to include the girl choristers - originally members of the Lichfield Cathedral School Girls' Choir - within the Foundation. There have been, and still are, many people who make up the Foundation and they have been split into categories to make the compilation easier to navigate. Within each page the postholders are arranged in chronological order and the choristers are also presented alphabetically. To view people within a category, select the group from the drop down list in the menu bar; if you are trying to locate a specific person, it may be easier to use the search box on the menu bar. There is still a great deal of information that needs to be collated to complete the details of former members of the foundation and, as such, there are blank slots, and unknowns within these pages. However, the collation of this information is ongoing and any corrections are always welcome by e-mail.